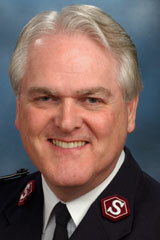 The 2006 High Council has chosen Commissioner Shaw Clifton – currently Territorial Commander, United Kingdom and Ireland - to be the next General of The Salvation Army. The announcement came on Saturday 28 January - day nine of the High Council’s deliberations at Sunbury Court, The Salvation Army’s conference centre just outside London. Commissioner Clifton will become the movement’s world leader on the retirement of General John Larsson at midnight on 1 April, General Larsson’s 68th birthday. The General-elect then spoke words of appreciation for the High Council. ‘I want the whole world to know that God has been in our midst,’ he said. We have heard his voice. ‘That is my simple but profound life-changing pledge in this sacred moment,’ he declared. Following the announcement, made in the High Council chamber, Indian and African members of the High Council hung a traditional garland and sash around the neck of the Army’s new international leader-in-waiting, and bouquets of flowers were presented to Commissioners Shaw and Helen Clifton by 11-year-old twins Jake and Jez Thomas, junior soldiers at Staines Corps – the nearest corps to Sunbury Court. Five members of the High Council had accepted nomination for the office of General: Commissioners Shaw Clifton, Israel L. Gaither, Hasse Kjellgren, Carl Lydholm and Christine MacMillan. Two other members – Commissioners Phillip Needham and Linda Bond – were nominated but declined to stand for election. At the conclusion of the balloting process Commissioner Clifton was declared General-elect. The public announcement was made a short while later, after private moments inside the High Council chamber. Commissioner Clifton is aged 60. He became an officer from Edmonton Corps, in the then British Territory, in 1973. He has served in his home territory, at International Headquarters, in Zimbabwe, the USA, Pakistan (as Territorial Commander) and New Zealand, Fiji and Tonga (again as Territorial Commander). He was appointed Territorial Commander, United Kingdom and Ireland, in June 2004. Changes in international appointments made necessary by the election of Commissioner Clifton as General will be announced in due course. The public welcome to the new General will take place in Kensington Town Hall, London, on Saturday 8 April at 4pm.